Exit USSR visa of type 1 (for temporary visits outside the Soviet Union). Not to be confused with exit visa of type 2 (green), which was stamped to those who received the permission to exit the USSR forever and lost Soviet citizenship. 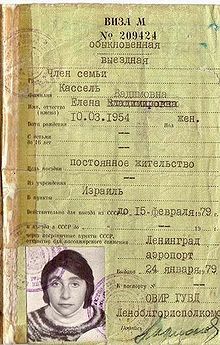 Exit USSR visa of type 2. For those who received permission to leave the USSR forever and lost Soviet citizenship. Russian empire visa stamp (1917). Brazilian multiple entry visa in a United States passport, with immigration stamps from Brazil, France, and the United States.